The Early Years Pupil Premium provides nurseries, pre-schools and childminders with extra funding to support children in achieving the best early years outcomes. If your child is 3 or 4 years old and receiving universal free early years education then we may be able to claim an additional £302 per year, depending on the number of hours they attend nursery. 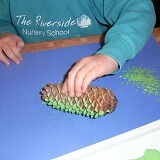 We use the funding we receive from Early Years Pupil Premium to subsidise a range of activities at Riverside. The intervention includes Universal – supporting the whole group, Targeted – supporting specific groups of children and Individual – targeting one-to-one specific needs. Supporting children’s speech and language Targeted Support - Staff received training to deliver the I CAN Talk programme. For all children that participated significant progress was recorded in the areas of; Attention & Listening, Understanding words and sentences, Speaking and Personal, social & emotional skills. Supporting children’s creative and musical development Universal Support - Growing Musicians deliver a half hour music session on Mondays that cover many aspect in the area of Expressive Arts & Design. Children have improved in their ability to listen, join in and contribute to the sessions. Children in receipt of EYPP have made 1 and 2 points progress over the year. Supporting children’s learning about their environment Universal Support - We have invested in training a Forest School Leader so we can offer our children outdoor experiences based on the Forest School Ethos. We also take children to visit Winnall Moors for Wildlife Tots sessions run by the Hampshire & Isle of Wight Wildlife Trust. Forest school and Wildlife Tots offer a holistic approach to learning and as well as learning about the environment, sessions have supported children to make relationships, build self-confidence and manage their feelings and behaviour. We have seen 2 and 3 point progress in these areas of learning. Supporting families to attend the summer outing Individual Support - We ensure that all families can be included in outings by using Early Years Pupil Premium to fund free places. Families have been included in summer outings which builds relationships between staff and families and between families within our community. Supporting links between nursery and home Universal Support - We have created a number of story sacks that include activities that children and parents can do together at home. Families have shared story sacks with their pre-school children and other children in their families. We have evidence of family involvement in the activities through Tapestry observations posted by parents. You will be asked to complete a confidential declaration form as part of your application for Universal free early years education when your child is 3 years old and again when they are 4 years old. You can inform us of any change in your circumstances at any time and ask us to check EYPP eligibility during your child’s attendance year. The funding follows the child, so should you move childcare provider, the funding will follow your child. When your child starts school, your school may also ask you to share information relating to EYPP so they can claim Pupil Premium.